American Health Line - Is the Administrative Fix Increasing Premiums? Remember the controversy over "If you like your health care plan, you can keep it?" After millions of U.S. residents with coverage through the individual market received cancellation notices for 2014 policies, that claim by President Obama was named Politifact's "Lie of the Year." The Obama administration responded with an administrative fix -- optional for states to accept -- that first allowed individuals to keep their coverage through plan year 2015. That fix has since been extended into 2016 and 2017. Fourteen states and Washington, D.C., turned down the fix, 10 accepted it for one year, four for two years and 21 for three years, according to an America's Health Insurance Plans map. Now the fix might be causing a whole new controversy -- as detailed by Modern Healthcare and Politico -- with some insurers saying it's causing them to increase 2015 premium rates for plans sold through the Affordable Care Act's exchanges. Insurers say the fix led to more young, healthy people keeping their plans. As a result, individuals who purchased exchange plans in late 2013 and throughout this year were older and less healthy than insurers expected when they set rates for 2014, before the administrative fix was on the radar. What Can We Learn From Preliminary Premium Data? 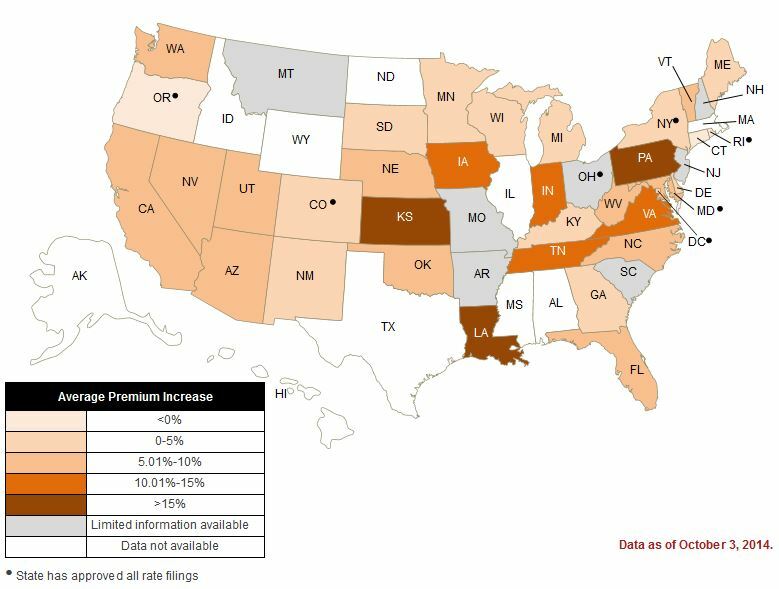 Even though the PWC data, shown below in map form, provide a lot of insight into 2015 premium rates, there are several caveats to consider. First, the average rate increases listed are for plans offered both on and off the ACA's insurance exchanges. That means the data might point to a trend -- whether states that implemented the fix are seeing higher average rate increases. But because the data lumps together exchange and non-exchange plan rate information, it doesn't get at the more specific question of if ACA exchange plans are seeing higher rate increases. That distinction can be crucial, as the Arkansas Times' David Ramsey reported. He found that the simple average of 2015 rates approved by Arkansas Insurance Department for exchange plans in the state -- which is implementing the administrative fix through 2017 -- were lower than those for 2014. At the same time, PWC projected an 11.7% increase on average. (Note: PWC has since stopped listing an average rate increase for both on- and off-exchange plans in Arkansas and instead lists a -2.0% average rate decrease for exchange plans only). Ramsey also noted that the figure PWC uses for average rate increases is a simple average of all proposed individual market rates, not a weighted average. That means PWC's averages don't take into account how many individuals are enrolled in each plan. It's not an incorrect measure, especially because the number of enrollees will change during the upcoming open enrollment period. However, it can have a major effect on the results. That might seem intuitive but many insurers are offering exchange plans for the first time this year, and others are offering new off-exchange plans. The increased competition created by first-time plans might have affected rates for the returning plans. However, whether the first-time plans are proposing higher or lower rates for the upcoming open enrollment period doesn't explicitly affect PWC's averages. What Does it All Mean for the 'You Can Keep It' Narrative? There's certainly some interesting results when comparing PWC's map with states' administrative fix decisions. The 18 "fix" states currently face average exchange premium increases of about 1.8% more than the 11 states (plus Washington, D.C.) that did not implement the fix, based on our calculations. Then again, the states that implemented the fix for only the 2015 plan year have lower average premium increases than states that did not implement the fix, and there are 21 states that are not included in PWC's data for all individual market rates. As we await more concrete details about premiums for 2015, here are two main takeaways from the preliminary data. First, any simple narrative about the premium rate increases under the ACA is probably not the whole story. As I discussed in August, there are lots of factors that affect consumers' health insurance rates and lots of important context about how the health insurance market functioned before the ACA. Further, the percentage of individuals who have kept their old plans varies by state, as does the proportion of those individuals relative to those enrolled in the exchanges. Most states' authority to review rate increases. Six states -- Colorado, Maryland, New York, Ohio, Oregon and Rhode Island -- plus Washington, D.C., appear to have finalized rates, while the other rates are still preliminary, per PWC. Second, with all the uncertainty surrounding the rollout of the ACA's exchanges and the number of people who would sign up for coverage, some insurers were bound to be better than others at predicting their plans' mix of enrollees. Some of that was probably skill, and some of it was probably luck.